ST. MORITZ, Sui.—Elisabeth Vathje slid into skeleton Royalty on Friday, joining a prestigious list of athletes who have stepped onto the World Cup more than once at the birthplace of the sport in St. Moritz, Switzerland. The 23-year-old won the bronze medal after rocketing down the world’s only non-refrigerated track in a two-run time of 2:19.89. “It feels great to be on the podium again, especially here in Moritz. It is beautiful here, and an amazing feeling to be on the podium again,” said Vathje, who had previously racked up three silver medals heading into the second-last World Cup race of the season. It was the 10th career World Cup podium for the Calgarian who also has one World Championship bronze medal on her resume. 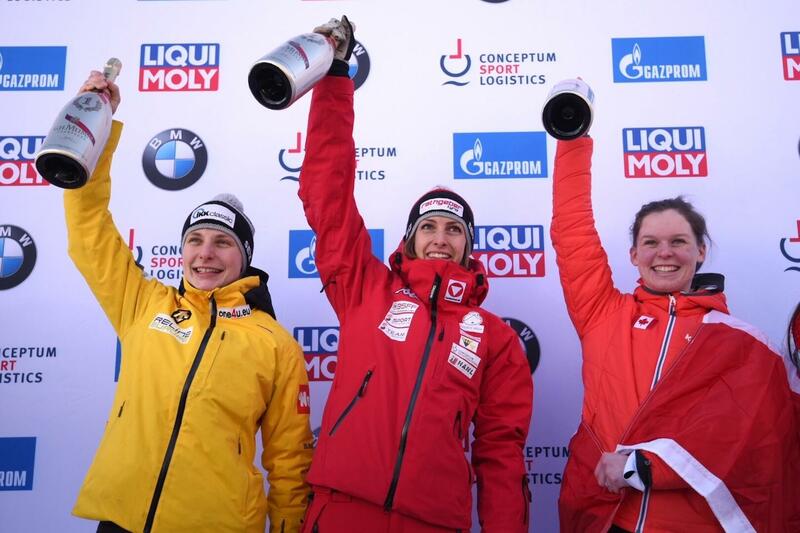 It was her second podium ever in St. Moritz. Vathje slid to the silver in 2015, and narrowly missed out on the medals one year ago when she was fourth. On Friday, she was poised to repeat that silver medal performance while sitting in second spot after her first trip down the 1,700-metre chute of natural ice that winds its way to the finish line in the town of Celerina. Vathje was forced to quickly compose herself after a mistake at the top of the track in her final heat to hold onto a podium spot. Vathje edged out her Canadian comrade for the final spot on the women’s podium. Ottawa’s Mirela Rahneva finished just .03 seconds back of Vathje in fourth place at 2:19.92. Rahneva bounced back following a disappointing first run where she was in 13th place to clock the fastest second-run down time at 1:09.35. Austria’s Janine Flock won the race with a time of 2:19.44. Germany’s Tina Hermann slid to the silver at 2:19.86. Jane Channell, of North Vancouver, placed 14th with a two-run time of 2:20.91. Vathje sits in second place in the Overall World Cup standings with just one race remaining on the calendar before the fastest athletes on ice head to PyeongChang for the 2018 Olympic Winter Games. Korea’s Sungbin Yun won the men’s skeleton race with a time of 2:14.77. Germany’s Axel Jungk claimed the silver medal at 2:15.64, while Latvia’s Martins Dukurs battled to the bronze with a time of 2:15.87. Kevin Boyer, of Sherwood Park, Alta., was the top Canuck in 18th (2:17.64). Dave Greszczyszyn (Brampton, Ont. ), and Patrick Rooney (Calgary) did not qualify for the second run with the top-20, finishing 22nd and 29th respectively. The World Cup continues on Saturday in St. Moritz with the women’s and two-man bobsleigh races.